George Eliot had no peer when it came to finding the drama at the heart of normal lives, lived out in tandem with the slow, gigantic rhythms of nature itself. The Mill On The Floss (1860), a story of the growth of the moral imagination in its young, sensitive heroine, Maggie Tulliver, restores to conditions of human existence that we can all recognize their actual originality and strangeness, and reveals once again how thoroughly, in the hands of a master like George Eliot, the art of fiction can satisfy our deepest mental and emotional cravings. George Eliot had no peer when it came to finding the drama at the heart of normal lives, lived out in tandem with the slow, gigantic rhythms of nature itself. 'The Mill On The Floss' (1860), a story of the growth of the moral imagination in this young, sensitive heroine, Maggie Tulliver, restores to conditions of human existence that we can all recognize their actual originality and strangeness, and reveals once again how thoroughly, in the hands of a master like George Eliot, the art of fiction can satisfy our deepest mental and emotional cravings. "As one comes back to [Eliot's] books after years of absence they pour out, even against our expectations, the same store of energy and heat, so that we want more than anything to idle in the warmth." Mary Ann Evans was born on November 22, 1819, at Chilvers Coton, Warwickshire, England, the last child of an estate agent. During her girlhood, she went through a phase of evangelical piety, but her strong interest in philosophy and her friendship with religious freethinkers led to a break with orthodox religion. When one of these friends married in 1843, Mary Ann took over from his wife the task of translating D.F. Strauss's The Life of Jesus Critically Examined(1846), a work that had deep effect on English rationalism. After her father's death she settled in London and from 1851 to 1854 she served as a writer and editor of the Westminster Review, the organ of the Radical party. In London she met she met George Henry Lewes, a journalist and advanced thinker. Lewes was separated from his wife, who had had two sons by another man, but had been unable to obtain a divorce. In a step daring for Victorian times, Mary Ann Evans began living openly with Lewes in 1854, in a union they both considered as sacred as a legal marriage and one that lasted until his death in 1878. With Lewes's encouragement, Mary Ann Evans wrote her first fictional work, "The Sad Fortunes of the Reverend Amos Barton," forBlackwood's Magazine in 1857; it was followed by two more stories published under the pseudonym George Elliot-"George" because it was Lewes's name and "Eliot" because, she said, it was good mouth-filling, easily pronounced word." At the age of thirty-nine she used her memories of Warwickshire to write her first long novel, Adam Bede(1859), a book that established her as the foremost woman novelist in her day. 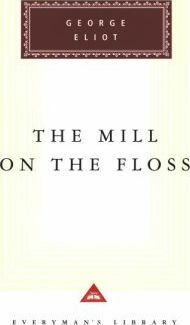 Then came The Mill on the Floss (1860), Silas Marner (1861), and Romola (1863). Her masterpiece and one of the greatest English novels, Middlemarch, was published in 1871-72. Her last work was Daniel Deronda (1876). After Lewes's death George Eliot married John Walter Cross. He was forty; she was sixty-one. Before her death on December 22, 1880, she had been recognized by her contemporaries as the greatest living writer of English fiction.